Khoem Sarom had all but given up hope. In the volatile years after the fall of Cambodia’s Khmer Rouge regime, he trudged through malaria-infested jungles on his own to search for a little girl: his missing niece. But he found only dead ends in the tiny villages and teeming refugee camps where he looked. His young niece, his sister’s only daughter, was gone. “I thought I would never again see my niece in this life,” Sarom said during an interview at his home in a quiet village outside Phnom Penh. It has been almost 35 years since the Khmer Rouge collapsed, leaving behind a devastated country. Historians believe one-quarter of the population perished during the regime’s four-year rule. The effects linger to this day. Across a recovering nation, Sarom’s story of loss is not unique. The Khmer Rouge split families apart in a ruthless bid to remake society. Though decades have passed, many families are still searching for missing loved ones, unsure if they are alive or dead. Khoem Sarom stands near his home outside Cambodia's capital, Phnom Penh. He has been searching for his niece ever since the pair was separated after the Khmer Rouge fell from power. For Sarom and others like him, a reality television programme offers a last chance to find closure after years of uncertainty. The show, called “It’s Not a Dream”, brings together long-lost relatives . The catch, of course, is that the tearful reunions are staged under the lights and glare of television cameras and a live studio audience. The end result is a jarring fusion: the gawking immediacy of reality television mixed with raw emotion left by the Khmer Rouge genocide. In the absence of a national programme to track down missing relatives, however, the show’s producers believe it can play a small but vital role. In its three-year run, “It’s Not a Dream” has orchestrated 27 reunions, all broadcast on national television. More than 1,000 applicants have asked the show for help. The show has a mostly older audience—Cambodians who lived through the war and who see their own haunting experiences reflected in the tearful stories recounted on screen. Like most of the show’s staff-members, many of whom are in their 20s or early 30s, Sokhayouk didn’t live through the Khmer Rouge years. “We were born after the war. We didn’t go through the Pol Pot regime, so we just know it through the stories and by watching movies,” she said. A camera pans across the audience during a taping of the reality television show, 'It's Not a Dream'. The show, Sokhayouk believes, can spark intergenerational discussions that are sorely needed in a country where the dark past has often been buried. It took until 2009 for the government to make Khmer Rouge history a part of the school curriculum. Meanwhile, a long-running war crimes tribunal set up to prosecute former leaders has so far convicted a single person. Two surviving former leaders are currently facing trial. In such an environment, some observers believe there is a role that even a reality show can play in healing old wounds. Still, not everyone is eager to air their tragedies in such a public forum. Like many Cambodians, Chhang lost family under the Khmer Rouge. For others, though, “It’s Not a Dream” isn’t just a last shot at bringing families together—it’s the only one they have ever had. Audience members watch a taping of the Cambodian reality television show, 'It's Not a Dream.' 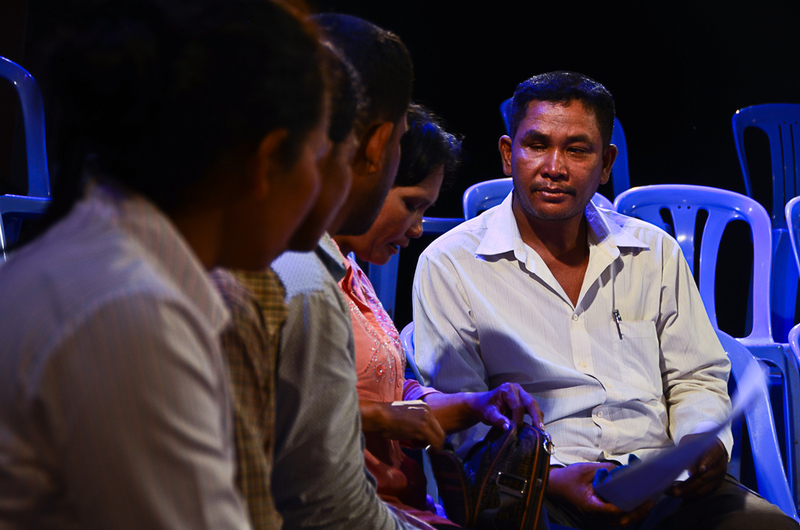 The show re-unites families separated by the Khmer Rouge. Many among the audience have been through similar experiences. The show's producer Prak Sokhayouk, watches the screen as taping begins for 'It's Not a Dream'. The show's producer Prak Sokhayouk, watches the screen as taping begins for 'It's Not a Dream'. Many of the staffmembers who work on the production are young and did not live through the Khmer Rouge regime. Seak Mala, left, sits on stage with the show's host, her uncle, Khoem Sarom, waits backstage with his family. The pair have not seen each other in almost 35 years. Khoem Sarom watches the show on a television screen backstage. He has not seen his niece since 1979. Seak Mala, left, sits beside his uncle and his immediate family after being re-united on stage. With the cameras off, Khoem Sarom, right, makes plans to get reacquainted with his niece, sitting to his right. It is the first time the pair have seen each other in almost 35 years. 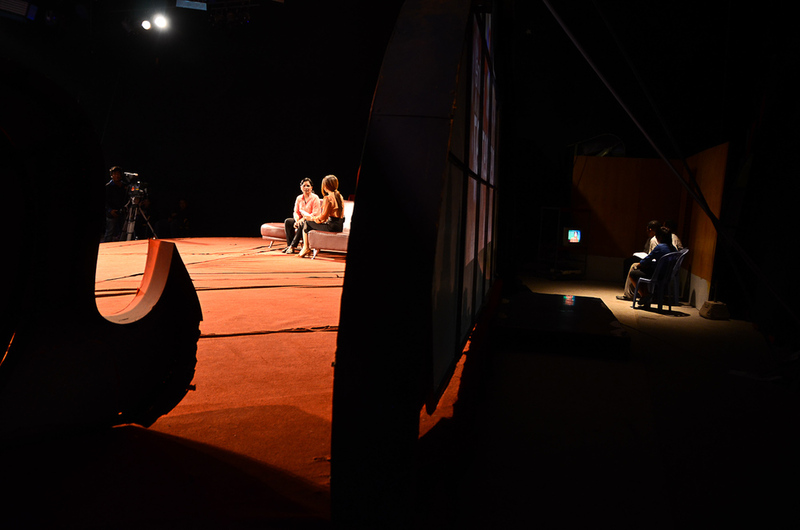 At a recent taping, Seak Mala sat on stage, waiting to tell her story. Mala had heard about “It’s Not a Dream” months before and decided to call the show. She asked them if they could find her family: her father, mother, grandmother and her uncle, Sarom. “I thought that if my parents and relatives heard my story, they would remember me,” Mala said. On stage, she stared at a large screen as the programme aired a pre-produced video showing Sarom describing his own loss. Backstage, out of view, Sarom himself waited in silence as Mala slowly realised the man on the screen was her long-lost uncle. The drama crescendoed and Mala, already in tears, was told she could finally meet her uncle. The programme’s saccharine reunion music blared through studio speakers as Sarom was led on stage. For the first time in decades, uncle and niece embraced--live on national television. “I thought I lost you forever,” Sarom said, sobbing in his niece’s ear. Sarom wiped his eyes with a cloth. “I don’t know if she’s alive or if she’s dead,” he said. A version of this story was published in the Guardian.